Walking around the downtown on a lovely spring day completing errands. Hey! Let’s stop for coffee! 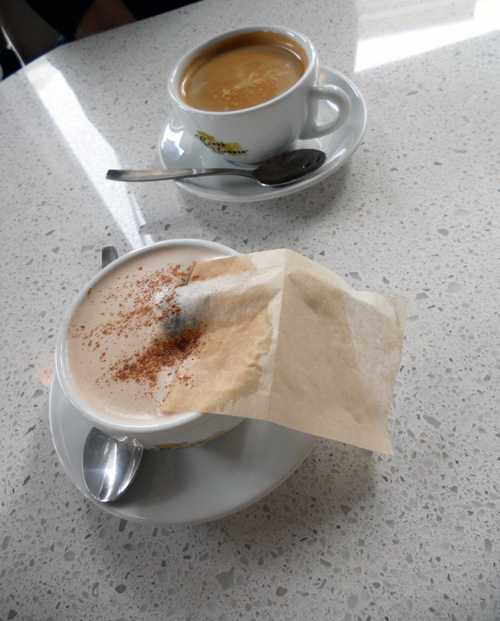 So we went to the new location of Macchiato Caffe and Paninoteca at The Juliet on the corner of Johnson and Blanshard streets. GJ’s americano was very good and I tried their Callebaut Spiced Chocolate Chai which was amazing! It looks like they have nice sandwiches and treats too. This part of town is becoming a bit of a food hub with this new place, Pig, Shine Cafe, Habit, Jackalope, Zambris and a block further Clay Pigeon, devour, Delicato’s, Special Teas and a large array of Vietamese, Thai and Indian places to name a few. Macchiato’s other location is on the corner of Broad and Broughton. Yum! My Callebaut Spiced Chocolate Chai was a rich yet mild hot chocolate with spiced chai and a sprinkle of cinnamon.